Fighter aircraft and live-fire exercises are just the tip of the spear at this year's African Lion exercise. More than 3,000 U.S. and partner-nation troops have gathered in Morocco for the annual joint force exercise, the largest on the continent. Set to end Friday, it aims to reinforce training engagements from previous African Lion exercises and create a foundation for future military-to-military cooperation. The lead component for the exercise is U.S. Marine Corps Forces Europe and Africa, said Sgt. Tatum Vayavananda, a spokesman for the command, who added that the executing unit comes from 2nd Marine Expeditionary Brigade. Along with command and control, "war-game"-type exercises, hundreds of Marines are conducting tactical field engagements such as live-fire ranges for small-arms weapons, nonlethal weapons systems and basic patrolling skills. They are operating mostly in the south in Agadir and Tifnit, as well as in Tan Tan. "There are a bunch of units here from every service, from Marine combat logistics regiments and law enforcement battalions to an Army law enforcement unit and a public affairs detachment," Vayavananda told Military Times. "The logistics Marines also support the maritime offload in coordination with U.S. Military Sealift Command and U.S. Transportation Command to get the gear here from ship to shore." 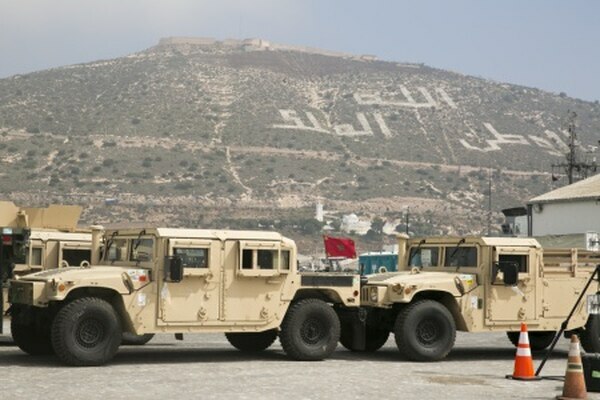 Marine Corps vehicles are lined up for inspection May 9 at the port of Agadir, Morocco, following a Maritime Prepositioning Force offload in preparation for Exercise African Lion 15. 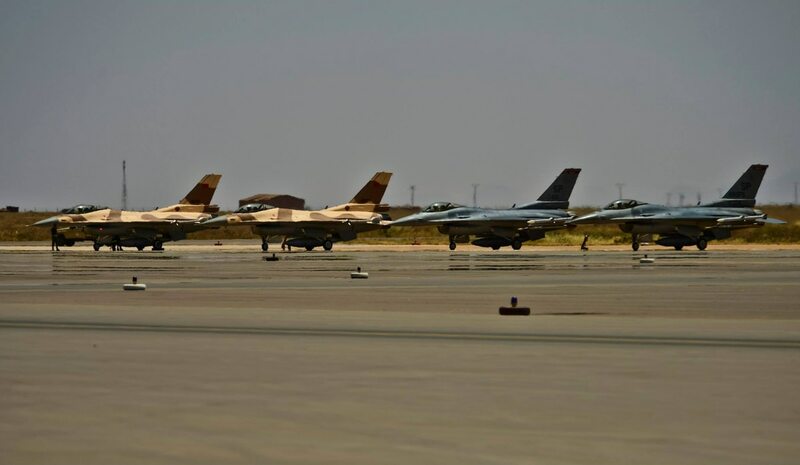 "The Moroccans have brand new F-16s they purchased in 2011, and they are already flying combat operations with them, which is extraordinary," Oury told Military Times. "They have one of the most capable air forces on the African continent, and we are very interested in working with their capabilities, and accomplishing objectives such as sharing our experiences and building stronger relationships." Six F-16 fighters from the 52nd Fighter Wing based at Spangdahlem Air Force Base, Germany, members from USAFE headquarters in Ramstein, Germany, reservists from the 55th Combat Communications Squadron, and troops from the Utah National Guard who are aiding in humanitarian efforts amount to over 200 Air Force personnel in the area, Oury said. KC-135s from the 100th Refueling Wing also have flown back and forth from RAF Mildenhall, England, to aid in refueling efforts. "We also have some joint terminal attack controllers embedded with Marines down south to help provide [assistance] for some close-air support," Oury said. Flying in Morocco gives both air forces a chance to test their maneuverability skills, particularly since the skies over that country are usually clear, Oury said. The exercise is a good opportunity to test how well the partner nations can work together if they find themselves joining forces in a future coalition, Oury said. However, the exercise is not related to "any specific threat," said Tech. Sgt. Alex Griffin, spokesman for USAFE-AFAFRICA. The Air Force component to the exercise is fairly new, Griffin said. A few years ago, the Air Force separately conducted exercise Majestic Eagle around the same time frame; the exercises have been brought together to reinforce more training on a number of fronts. "Every other year, the scale of the exercise alternates," Oury said, explaining that African Lion is intentionally planned to go from a large-scale exercise one year to a smaller version — mostly ground exercises — the following year. In 2013, about 1,400 Marines, soldiers and sailors had to pack up and redeploy out of Morocco days after arriving for African Lion. The Marines, led by 14th Marines, 4th Marine Division, a Marine Corps Forces Reserve artillery unit out of Joint Reserve Base Fort Worth, Texas, but with subordinate units spread across 13 states, had been training for the event for about six months. "It was a political situation that was beyond our control," Oury said. The surprising decision was a result of the Obama administration's support for the placement of United Nations human rights monitors in disputed Western Sahara territory. The Air Force got in only one day of training, Oury said. "That had no impact on the relations on the military side; the militaries were in complete understanding," Oury said. "The good news is that it has reinforced the good will to work with each other in the future, and to finish the job we started in 2013." That same year, the Marine Corps Embassy Security Group stood up detachments at U.S. diplomatic posts in Juba, South Sudan; Casablanca, Morocco; and Freetown, Sierra Leone — the first of 50 locations that State Department officials identified as places where they would like to add detachments of Marines. With this exercise and beyond, Marines and the remaining services "get to ... figure out what we can do to operate on the same song sheet and improve our capabilities on all fronts," Vayavananda said. "This is important, not only because Morocco is one of our closest and oldest allies in the region, but because we'll be able to work with them in the future with familiarity and history together as militaries." Senegal, The Netherlands, Belgium, Germany and Tunisia are also participating in African Lion.